The evolution of the Moscow party scene either changes with age or with years. May be it changes with the trends or people? The range of bars in the capital of bears and balalaikas is tremendous. I have been to and lived in a lot of places and from what I have experienced I can tell you that no one loves to party likes the Russians do and they are good at it; they do it with a lot of thought and soul. Nothing is done halfway and never stops changing, evolving and blooming. This is something to experience from within and you will never be left indifferent. Come night, civilians go to sleep and the party monsters wake up. You don’t know what night life is if you have never been to Moscow. Run with me through a couple of places. Saturday night started off at a calm pace, meeting with some friends at ‘Chainaya. Tea and Cocktails’, the only bar in Russia that is in the top 100 of the world, a place of peace and quiet for the soul, one of the only places in Moscow where the atmosphere does not change throughout the week, neither do the bartenders. What makes it special is the dedication to be the best, not for the awards, but because every person that works there is passionate. They do everything because they love it, and you can feel it. Starting with the cocktails, Mandarin Spicy is my cocktail of choice; no one makes it like a Chainaya bartender does, no one! Their secret weapon is the Chinese cook. He can barely pronounce two words in Russian but the way he cooks can make you feel a life time of culinary bliss. Recruited from a village in China he does not try to Europeanise his creations, that is what makes his food taste like nothing you have tried before. After a calm relaxing start we moved to ‘Darling I’ll call you back…’ You know how sometimes you just want to feel like you are 18 again and drink cheap cocktails and go crazy on the dance floor, well welcome. I adore this bar, the drinks are good, the music is nostalgic (even when I was 10 I was not THAT excited to hear N’SYNC) you have to agree with me that bathrooms are an important aspect of any bar, here you will not be disappointed. The owners of the chain thought everything through, the cabins have noise buttons of different surroundings like the metro, an airport, or a train station, just go to the bathroom to receive a call, press the button and no one will ever know that you are going crazy at a bar. The bar hoping continued with a relatively new bar-club ‘Phantomas’, situated in the heart of the red October. 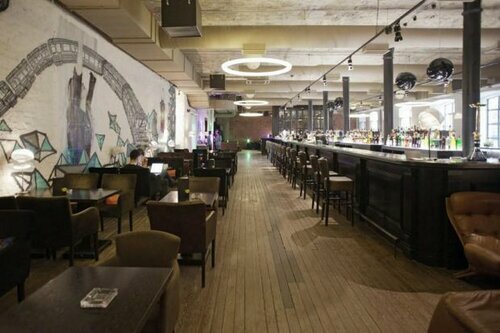 History pit stop: the Red October used to be a chocolate factory, closed not too long ago to give space to a party hub; bars, clubs cafes and restaurant are piled on top of each other. Upon our arrival we were told that they were closing, keep in mind that it is a Saturday, it was 2am and Moscow NEVER sleeps. After a few phone calls and a long conversation we went in to discover an absolutely empty soulless space. For research purposes I found out that they have a stage and the place is buzzing during a concert and they are often booked for corporate parties. Not fun. Onto the next one. This brings us to the ‘Noor Bar’. Might probably be the love of my life. Starting from the décor; during the day you are sitting in a European bistro eating splendid food, at night you are in the right place to drink and dance. When you are talking to the bartenders you are talking to your best friends. The cocktails are little sips of heaven. The music makes you move without you wanting to, especially when Stas Modnik is DJing. I don’t know where to start, any time of the day, any day of the week you can come here and feel like you are home. This is the bar of choice for the international, the creative and cocktail loving kind of people. The only recommendation I dare to voice is to try everything on the bar and food menu, you will not regret it! It is now 6am I have put a stop to the madness. 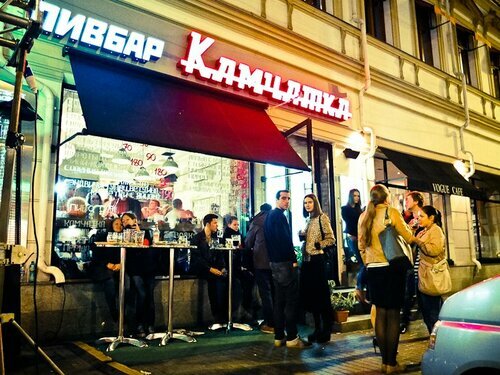 We are now a week later, this is Thursday, and I am taking you to the beer bar ‘Kamchatka’. Welcome to the USSR and everything you had back then. The ridiculously low prices, the queues to order anything, the waiters to say ‘you money first, your order later’ and ‘it will be about…roubles’. That bar has two kinds of visitors, hipsters and the people who actually spent most of their conscious life in the USSR. The alcohol seems to be cheaper than at a supermarket the music takes you back to the 70s and 80s and you just let go, mix in and go crazy. 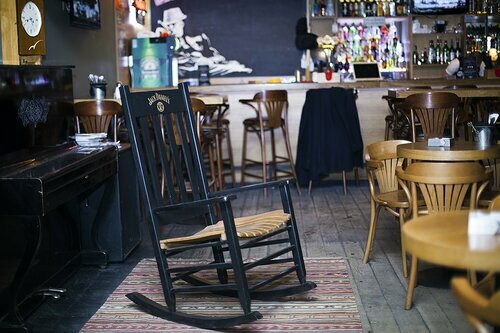 This is the kind of bar where you can spend the whole night and never notice the time go by. It is late at night or early in the morning, as you wish, but we are at ‘Moloko’, translates as ‘Milk’, not to be confused with ‘milk’ the concert space. History pit stop: named after the building it is set up in, known as the first milk shop in Moscow. Moloko has a restaurant feel to it, it serves food but it is not a restaurant. As a side note; Moscow bars are like Russians, they strive to please everyone in any way possible, so the choice of dishes will always be of a high standard. The bar is for a more grown up, higher class of visitors. At least that is how the piano and the interior design makes you feel. It makes you want to order an Old Fashioned, smoke cigarettes and discuss world politics at length. Flashback time, it is summer 2012. It is any given week end. We are back at the Red October. We are at ‘Gypsy’. We are frolicking in the moment. We are transported to our happy place. But don’t feel it yet? Let me describe some more. You are on an island on the Moscow River. You are on a roof top. It’s a warm night. You go to one of the bars, there are three, and you order anything you want. There are two swimming pools, there is a stage, there is music, you don’t see or hear anyone, and you are filled with that feeling of relaxation. Just for one night, you can be whatever you want to be, you’re on an island. Flash forward to the 5th of April 2013. We are still at the Red October, it is the opening of ‘WT4’. You enter a massive space, with a very long bar in the middle. Leather couches along the walls. There is an amazing vibe, there is a tremendous amount of people, and you suffocate. The DJ plays an eclectic set and I honestly wish I could say what I think of this place, but it’s the opening night, it has amazing potential, it was a good night. Two things I can tell you for sure, the creators did a great job, and by the zombies that left at 5 in the morning, you could tell that the night was a success. Now, get me some aspirin! Without bars we can’t go anywhere! There is a concept called ‘the bar next door’. That is a place which is usually dubbed as a second home, where you know everyone, where everyone knows you, where you can have a meeting and at the same time have a great time on a Friday night. Those are the kind of bars that we need more of. Due to an overload at work I have very little opportunity to find myself sitting at a bar, so for me this is an occasion to see friends and have some good cocktails or some wine. Not to be disappointed by the bartender, by proxy; by the bar. It is important that it is not too loud, and not too quiet, the best bar, for me is the Mercedes Bar, I always take my friends from London there. 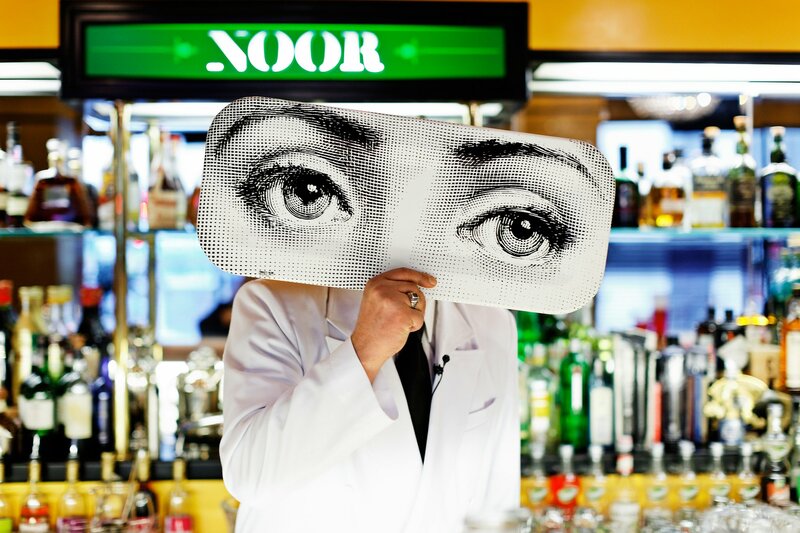 And of course the Noor bar, that works late even on week days! Super. From what I have noticed bars have become a lot more popular than clubs. Even though they always existed they hid from me. Going to a bar is the equivalent of inviting friends over, its’ so homely. These are a lot of categories. If I want to spend time with musicians I will go to 16 Tonns; if I want to be surrounded by foreigners and fashionistas I will go to Noor bar. I can keep on going forever! There are a couple of common denominators- everything happens drunkingly happily and dancing included. Moscow, objectively, never had a long ‘bar history’. But in the last twenty years there was a noticeable development leap. The Moscow community and businessmen had time to travel, discover new ways, receive knowledge and import all that to the capital. At the moment the bar crowd is spread out; by audience, interests, the way of life. I am sure that in the near future we can expect niche projects and the appearance of a new bar crowd, the ones born at the beginning of the nineties have a different mindset and are more western. Who goes to bars? Consumers who are branding victims are able to recite different brands for hours, but are unable to remember the names of at least, two classical cocktails!